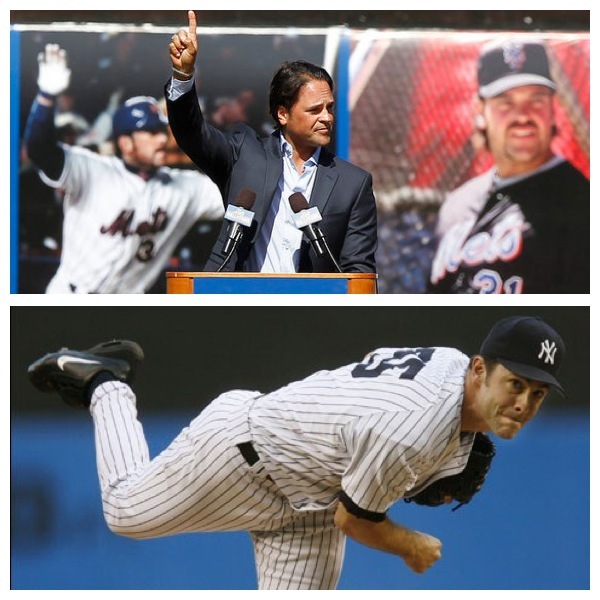 Mike Piazza and Mike Mussina’s dreams were shattered yesterday as both fell short in the 2014 Hall of Fame class voting. For Piazza, he could at least take away the fact that his voting total rose from 57.8% to 62.2% in his second year on the ballot. As for Mussina, he garnered only 20.3% of votes, leaving him a long way to go to reach the 75% of the votes necessary to reach the Hall of Fame. If we weren’t live in the cloud of the “Steroid era”, you could argue it was an outrage Piazza was not a 1st ballot Hall of Famer, let alone 2nd. But now we will have to wait another year to see if the third time will be a charm for the game’s greatest hitting catcher. I can’t say I agree with the majority of voters when it comes to Piazza’s case. 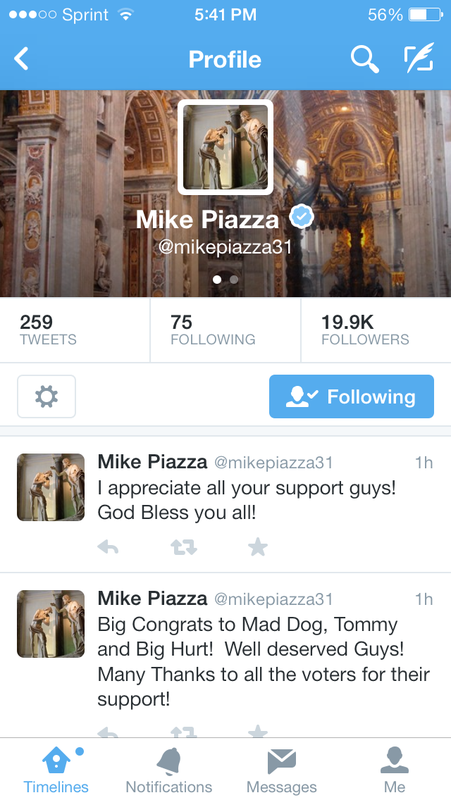 It is very clear that writers are not voting for Piazza SOLELY on the suspicion or THOUGHT that he MAY have done PEDs. The only problem with this? THERE IS NO ACTUAL EVIDENCE. I realize the few that continue to not vote for him, who are trying to delay his inevitable enshrinement, are hoping something may eventually come out to answer any question that may remain. But if your job is to vote on the facts at hand, I do not know how in good conscious you don’t vote for someone who is without a shadow of a doubt, one of the very best of all-time. In case you forgot just how truly great he was, he are some supporting facts. Piazza is a career .308 hitter, an unheard of number from a catcher, with 427 career home runs, 396 of which came while playing behind the plate. He was named the 1993 Rookie of the Year, went to 12 All-Star games and earned 10 silver slugger awards along the way. Simply put, his numbers speak for themselves. I have no doubt that Piazza’s day will come, sooner rather than later. To put it into some historic prospective here, this is how the names he is so often compared to fared on their HOF ballots. The gold standard, Johnny Bench, is the only catcher to ever go in on his first year of eligibility. Yogi Berra and Carlton Fisk each went in on their second try and the late Gary Carter, took 6 times before he got the nod. Assuming there is no new allegations brought against Piazza, I envision him receiving the necessary votes within the next 2-3 years. Mike Mussina finds him in a far worse shape. It wasn’t that he was expected to be a first ballot Hall of Famer, but his numbers were startling lower than initially thought. The only pitcher I could find in recent memory that overcame a lower first ballot vote total was Bert Blyleven, who actually received a lower total than Mussina’s 20.3% with 17.5%. Blyleven, eventually overcame the odds and was voted in on his 14th try. Mussina, does have fine career numbers, posting a 270-153 career record with a 3.68 era over his 18-years. Eight of which were spent with the Yankees, where he went 123-72 with a 3.88 era. He was named to five All-Star teams and won 7 gold glove awards in his career. Mussina also finished in the top-5 in the AL Cy Young voting 6-times, but never won the award. He does possess a great career winning percentage of .638, with only 11 current Hall of Famers who can claim a better one. However, much of that can be accredited to playing on the talented Oriole teams of the mid-90’s and Yankees of the 2000’s. His 3.68 career era would give him the third highest among pitchers in Cooperstown, that notion doesn’t exactly excite the voters. Although Mussina seems to be in good spirits, I wouldn’t hold my breath about him ever entering the hall. I know everyone wants to compare sabermetrics and other advanced statistical analysis we possess today, but sometimes you have to sit back and trust your gut instincts off of what you watched in front of you. If you ask me, Mussina does not pass “the eye test”. I watched the majority of his career, and NOT ONCE did I ever feel like I was watching an all-time great out on the mound. Nobody ever feared stepping into the batter’s box against Mussina and those factors should still mean something. Even though we have Greg Maddux, Tom Glavine, Frank Thomas and Jack Morris coming off of next year’s ballot, there is good company joining the party in 2015. With the likes of Randy Johnson, Pedro Martinez, John Smoltz, Gary Sheffield and Carlos Delgado coming aboard, don’t expect many extra votes to be opening up for Piazza and Mussina. Margareth from United Kingdom, August 30, 2012 at 5:41 PM Hotel San Luca was wonderful! We avrerid late evening and received a very warm welcome. Througout our stay all staff were extremely helpful. Our room was very good very clean: lots of good quality toiletries: able to control air-conditioning: well-stocked mini-bar. Fabulous breakfast every morning: staff very good Shame we had to leave.